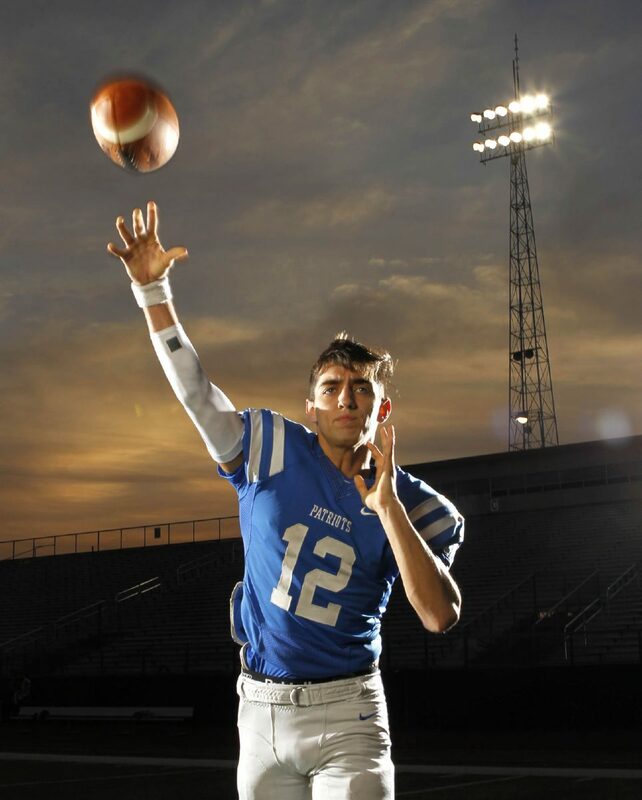 All-Area Football Player of the Year quarterback Landry Gilpin of Mission Veterans. Mission Veterans quarterback Landry Gilpin is The Monitor’s All-Area Player of the Year. EDINBURG — In 2016, the Mission Veterans Patriots threw the ball a lot, scored a lot and reached the third round of the UIL Class 5A playoffs for the first time in school history. The effects of making history are more than applause or pats on the back. Making history meant other schools — and school districts — would look at Mission Veterans’ winning model and try to replicate it the best they can. In addition to the Patriots losing important offensive pieces to graduation, offensive coordinator Lupe Rodriguez left Mission Veterans to build his own staff and program at PSJA High. Despite the roster and coaching turnover, one of Mission Vets’ biggest keys to success remained in Patriots blue: junior Landry Gilpin. After a season during which he threw for 3,172 yards and 25 touchdowns to only five interceptions while also running for 1,718 yards and 23 more touchdowns, Gilpin was the easy choice as The Monitor’s All-Area Player of the Year. Gilpin was installed as the Patriots’ starting quarterback in the spring after spending his sophomore season as a wide receiver catching passes from The Monitor’s 2016 All-Area Player of the Year, Diego Hernandez. But the 2017 season wasn’t Gilpin’s first time as a starting quarterback. Mission Veterans coach David Gilpin threw his son, Landry, into the fire as a true freshman. Landry posted modest numbers as a passer (1,589 yards, 11 touchdowns, eight interceptions) but demonstrated uncommon mobility out of the pocket early in his career (895 rushing yards, 11 touchdowns). However, 2017 was something else. “Once we ended our season at Alamo Stadium (in San Antonio) in 2016, I said to him, ‘No. 12, it’s your ball,’” David Gilpin said. “I thought our offense was going to be pretty good with Landry, but did I have a number in mind? No. Did I know he was going to combine for almost 5,000 total yards and almost 50 touchdowns? I didn’t. After non-district tests against Harlingen High and Mission High, the switch turned on for Landry Gilpin in district play. He threw 21 touchdown passes in eight district games, even though he went without a touchdown throw in one of those outings. He also threw for 300 or more yards in five of 12 games in 2017. Landry Gilpin loved it when opponents keyed in on him as the focal point of the Patriots offense. One of the weapons Gilpin has the luxury of throwing to is sophomore wide receiver Garcia, who is The Monitor’s 2017 All-Area Newcomer of the Year. The Gilpin and Garcia connection dates back to their days as teammates at the Boys and Girls Club in Mission. Gilpin remembers those times fondly.